Hidden away in the desert mountainside and only 17 miles from the Las Vegas Strip lies the lush and pristine Lake Las Vegas Resort. A private resort area which offers two beautiful golf courses, luxury hotel accommodations, and private homes and villas, Lake Las Vegas is a must-visit for golfers of all experience. Choose to stay in the 4-diamond rated Westin at Lake Las Vegas or steal away to a private villa, perfect for groups, with breathtaking views of the lake and golf courses. Golfers of all skill levels will enjoy the dramatic landscaping and beautiful panoramic views of this private lake resort. The Reflection Bay Golf Course is the first public resort course in Nevada designed by Jack Nicklaus and plays host to the Wendy's Three-Tour Challenge. 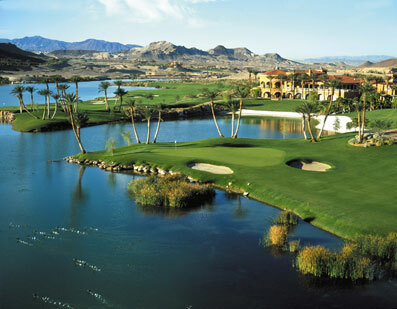 The golf course features five holes played along the waters of Lake Las Vegas and offers a unique 199-yard, par 3 eighth hole with beaches, bunkers, and palms that create a dynamic shoreline and drop. "Hole number 10 is a memorable hole," says resident head pro John Spatz, "with the Lake winding twice through - once at the tee, and then again up against the green." It's hard to imagine that any hole at Reflection Bay could be forgotten - every hole is just breathtaking! The difference in play between the two courses make the resort a perfect golf getaway, whether for tournaments, corporate outings, or a standard foursome Lake Las Vegas has much to offer. The Falls Golf Course features a desert experience played along the mountainside at the resort. The Falls, designed by Tom Weiskopf offers varied mountainous landscaping surrounding the Lake Las Vegas Resort to the desert floor. Elevation changes range from subtle undulations on the front nine to dramatic drops from the tee boxes on the back nine. Breathtaking scenery, including panoramic views of the Las Vegas Strip, are features of the Falls at Lake Las Vegas. Of course it wouldn't be Las Vegas if gambling wasn't an option. The Lake Las Vegas Resort features a full service casino at the Casino Montelago, and a boutique casino within the Hyatt. Live entertainment can be found throughout the resort every night of the week, including the popular outdoor concert series "Stars on the Lake," where famous musicians are showcased on a floating stage on the Lake. Ask your Golf Adventures Golf Specialist for listings when booking the Lake Las Vegas Resort.